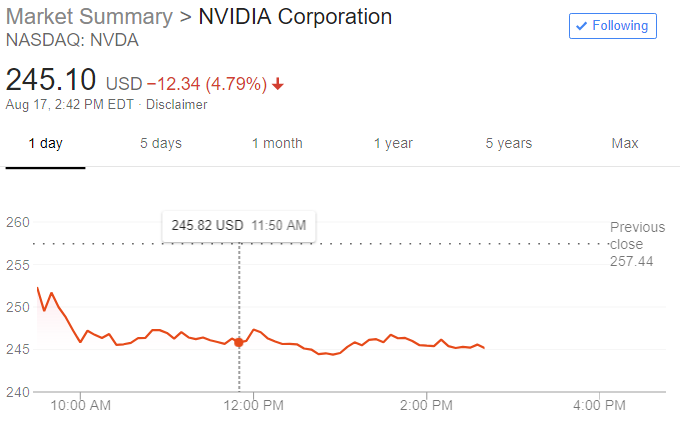 NVIDIA Corporation (NASDAQ:NVDA) reported their quarterly earnings numbers for the second quarter of the fiscal year 2019. The company lowered third-quarter guidance by a hundred million dollars, and despite reporting second-quarter revenue and earnings that beat estimates, share prices dropped today by 5 percent today. Revenue for the second quarter of 2018 was $3.12 billion compared to $2.23 billion in the second quarter of FY2018. More importantly, NVIDIA was very happy to report growth across every platform that it builds products for. While the overall theme of NVIDIA’s message was good, Jensen Huang did instruct investors that the company was guiding down revenue for the upcoming quarter, citing the fall of cryptocurrency-driven demand for Geforce video card products. NVIDIA’s core business, PC gaming, is very healthy. While the earnings game can slide either way on a knife’s edge, depending on what analysts expect, the numbers that NVIDIA reported yesterday are holistically very solid. Other segments are indeed running a bit flat in terms of sequential growth. NVIDIA’s gross corporate margin was 63.5 percent for the quarter! For reference, AMD (NASDAQ:AMD) has been struggling to maintain more than 35 percent and has even stated they would be happy with 40 percent gross margins though keep in mind this is including both CPU and GPU products as well as semi-custom low margin work such as console SoCs. Pascal and Volta products performing well, Crypto revenue all but gone. NVIDIA continues to receive the lion’s share revenue from its core focus – gaming. 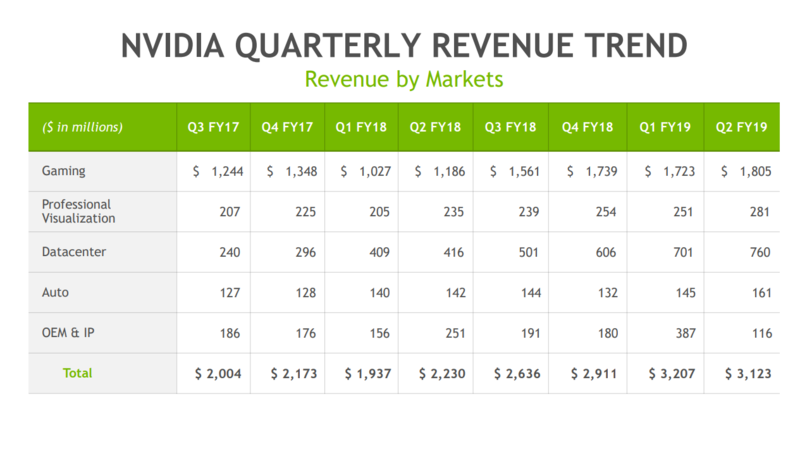 Geforce based products accounted for a whopping $1.8 billion for Q2 FY19. 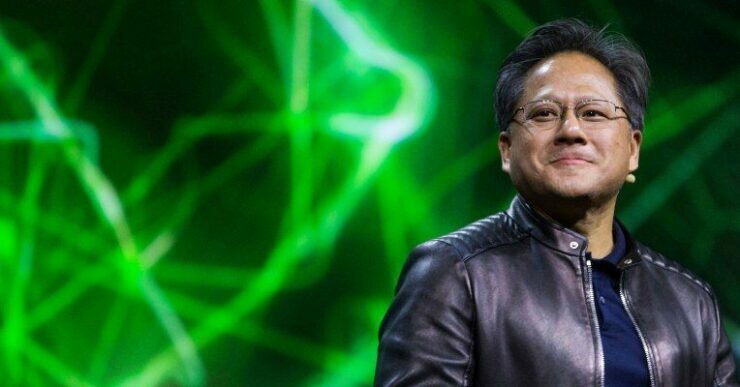 Keep in mind that just one year ago the Geforce division of NVIDIA booked $1.18 billion. Geforce 10xxx series continue to perform well in the market. The Geforce GTX 1080 Ti is still, over a year after release, unmatched in performance. Anyone with a high-end 4k setup, or VR rig has only one option.. and that’s NVIDIA. Its also a very high margin product for NVIDIA and the massive 52 percent year over year increase in Gaming’s revenue really shows what the performance crown can do. “We believe we’ve reached a normal period as we’re looking forward to essentially no cryptocurrency as we move forward. Our revenue outlook had anticipated cryptocurrency-specific products declining to approximately $100 million, while actual crypto-specific product revenue was $18 million, and we now expect a negligible contribution going forward. So that may be the official end to the madness surrounding both NVIDIA and AMD video cards in regards to cryptocurrency mining. Demand has finally, finally slowed to the point that the market is saturated and no new farms are coming online in a substantial way. The market as a whole, including Ethereum and other coins that are still profitably mined on consumer-class video cards, has sagged to the point where many investors and miners alike are scared off. Ethereum has recently discussed changing its mining rules which would make it even less profitable to mine. Crypto is finally (hopefully) gone in terms of crazy back-ordered Radeon and Geforce products. But perhaps even more refreshing is maybe we can finally stop listening about cryptocurrency mining’s perceived financial effect on AMD and NVIDIA. The fact is, despite both companies’ management stressing over and over that Crypto isn’t and was never a meaningful impact item on the bottom line, investors STILL chose to rally behind/against this topic when looking to make bullish or bearish cases for either the Green or Red teams. 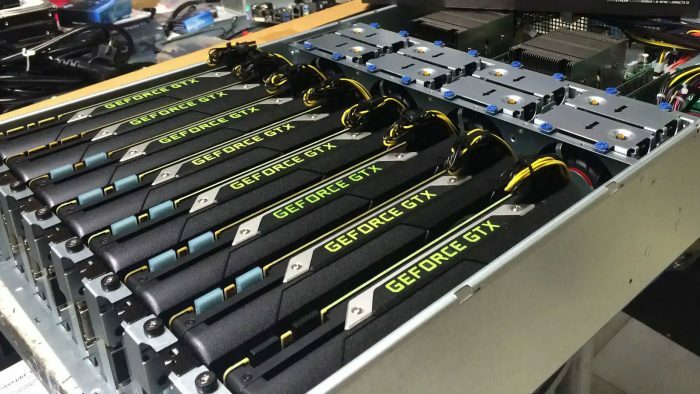 Crytpo may have added $100 million a quarter at its peak, but for a company that does 15x that in Geforce revenue alone, it was never going to be make or break. Now having said that, the market reacted negatively after NVIDIA’s numbers and comments were made public to the world. NVIDIA stock plummeted over 6 percent in after-hours trading Thursday evening and today prices are looking to stabilize at minus 5 percent. NVIDIA did adjust revenue guidance for the third quarter down to $3.25 from $3.34 billion, due in part, to Cryptocurrency demand falling off. NVIDIA is just days away from announcing its hotly anticipated next generation of Geforce video cards, the RTX 2080. Our take is that if NVIDIA can post such strong growth in its gaming division with Pascal cards that are approaching more than two years old, then an entirely refreshed lineup of Turing based video cards should help the twenty-five-year-old company out of Santa Clara continue to drive revenue growth in its most important product line. The data center’s growth continues to be powered by products based on NVIDIA’s Volta GPU architecture, namely the Tesla V100 GPU and the DGX supercomputing systems. These too will be receiving upgrades in the form of Turning based cards in due time as well. NVIDIA is rolling out a top-to-bottom product stack based on the revised 12nm node and should be positioned very nicely to bridge the gap until next-gen 7nm parts roll out in the latter half of next year. These Turing products look to have some real improvements and additions under the hood and not simply a half node shrink from TSMC’s 16FF process. They have no competition in sight from the Radeon team so growth will only be checked purely by market demand, a very good position for any company to be in.